Spring in the Colorado Rocky Mountains can be a tease. One day, temperatures soar to 60 degrees and you swear spring has arrived. The next, it’s 20 degrees and snowing. On those warm days, summer feels like it is just around the corner. I long for a good hike. But hiking season is months away in the Indian Peaks Wilderness. Fortunately, Boulder is just a short drive away, and offers plenty of options in the Flatiron Mountains. No trail in the Flatirons is perhaps so beloved by locals as Mt. Sanitas. Though it’s definitely not the highest peak in the Flatirons, the 3-mile loop offers a great workout and stunning views. Climbing over 1,300 feet in a little over a mile, my heart gets pumping. My first foray on Mt. Sanitas came before I even lived in Nederland. Living in Grand Junction, I accompanied my husband on a business trip to Boulder. After researching hikes in the area on the internet, I read about Mt. Sanitas. Perfect for an afternoon hike with our dog. It didn’t take long to realize what I had gotten into. Right out of the gate, I clambered up rocks and wooden steps, breathing hard. After that initial steep climb, you get a break by walking along small flatter section. But it’s only a brief respite. About 20 minutes in, you encounter an unrelenting section that goes up and up and up. Looking above, I spied people moving slowly up the rocky mountain. It required squeezing between boulders, as well as stepping up rock steps. But with each step up, the views get grander. The entire city of Boulder lies below you. On a clear day, not only can you see the skyscrapers of Denver, but even 14,000-foot Pikes Peak, almost 100 miles away. By persevering up the last 1/4 mile, you will get views to the west of the Indian Peaks Wilderness as well. Reaching the peak, you will probably not find yourself alone. As mentioned, this hike is one of the most popular in Boulder and attracts people both on week days and weekends. You can head down the eastern side towards the Sanitas Valley Trail and complete the loop. It’s a great workout for a short hike, attracting people of all ages. Years ago, I hiked Mt. 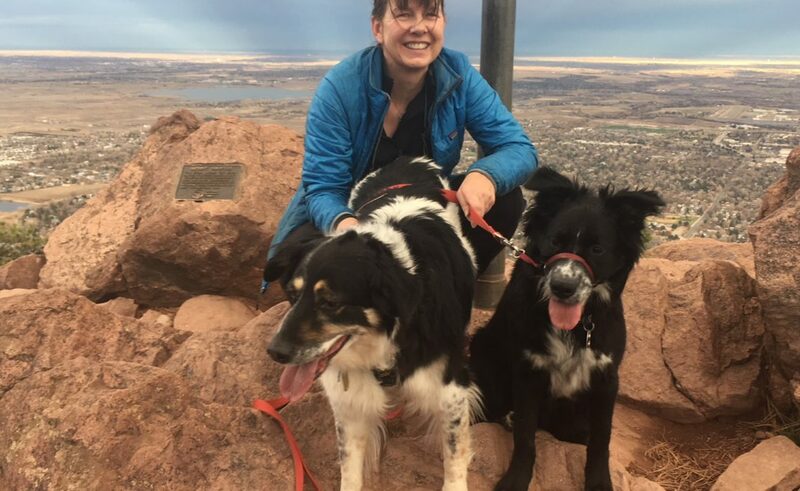 Sanitas with our two dogs during a beautiful winter afternoon. I ran into a gentleman hiking slowly but steadily. Sporting a head of silvery hair, he appeared older, but his bulging calf muscles showed he was still fit. I paused for a moment on the trail and sparked a conversation. Working five days a week and commuting to Nederland can feel tiring sometimes. So tiring, that’s it’s easy to talk myself out of exercising. But then I think of that chance meeting. If he can do Mt. Sanitas every day for three months, surely I can summon up the effort to get out there once a week. I recently summited Mount Sanitas for the first time last month, but I went via the Lion’s Lair trail. I think that might be my favorite trail in the area right now. Haven’t braved coming up the other way though, LOL!